Are you looking for ways to expand learning and growth in your homeschool? Are you trying to do more than just school at home? Hewitt Homeschooling offers a variety of ways to help home educators capture the interest of their students. By focusing on more than just academics, programs offered by Hewitt Homeschooling encourage real learning that is personalized for your child. One program offered by Hewitt Homeschooling is their Chronicles of ...State History Notebook. Intended for grades 3 to 8, this curriculum will offer your student an in depth look at the history of a state of their choice. 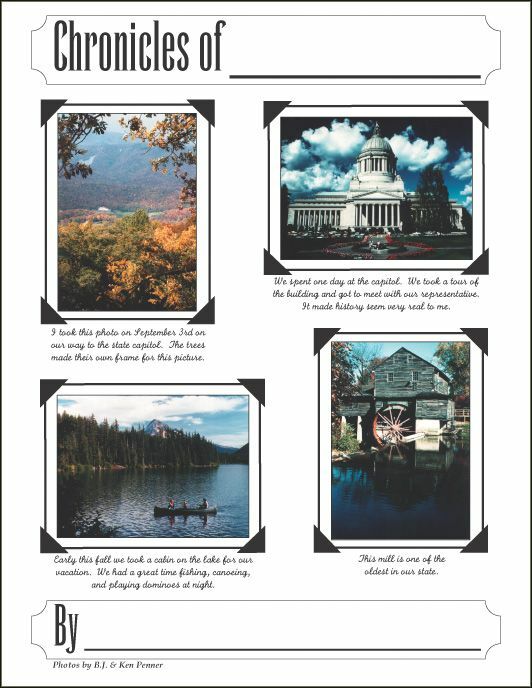 Printed on thick paper to give the finished product a scrapbook look, the State History Notebook is divided into sections that focus on state facts, geography, history, government, jobs, and other areas of interest. Your student will practice writing short reports, making a timeline, learning about immigration, and visit a place of historical interest. Packed with creative ideas, your student will be proud of their finished project. In order to successfully complete the notebook, you will need to provide resources about your state (which we found on the Internet and in books we already owned), and plenty of craft supplies. Access to a camera would also be helpful. Regardless of the historical time period we are studying, PA State Law mandates that homeschooled children study Pennsylvania State History every year. In the past we have visited a historical site of interest and done a little reading and writing about our experience. The Chronicles of State History Notebook blended beautifully into our curriculum, and eliminated the stress of fitting in one more thing. One day a week I would have James complete a page or two from the notebook. I would usually have this happen on a day of "lighter" work, for us this meant on Wednesday or Friday. Using the Internet or books we already own, James could easily complete most of the assignments. Some of the activities required additional time and we would carry them over to the next week. Since there isn't a set amount that we have to learn about PA history, we are able to go at our own pace and James is allowed to study more about topics that interest him (flags and making graphs) and less about those that don't (interviewing people and writing about anything). By doing this three to four times a month, James will have a nice little notebook of PA History to present in his portfolio at the end of the academic year. It looks like we'll only get through about half the notebook this year, so we will be able to use it again next year as well. We followed the book in order, although it doesn't appear to be a requirement to do it that way. I just opened it up and had him begin learning. It worked well for us and we continued on. It's exciting to learn about state history. Hewitt Homeschooling Chronicles of... State History Notebook retails for $19.95 on the Hewitt Homeschooling Site. In addition to this product, Hewitt Homeschooling offers items in every subject category for grades Preschool to Grade 12. Other Schoolhouse Review Crew members are reviewing items such as First Report Writing, Lewis & Clark, and Literature Selections. Head over to the TOS Blog to view their reviews on these amazing products. Disclaimer: As a member of The Old Schoolhouse Review Crew, I received the Chronicles﻿ of... State History Notebook for free in exchange for an honest review on this blog. I received no other compensation.